The majority of my Halloween memories can be measured in food. Whether bobbing for apples or dipping them in sticky toffee, biting doughnuts from a string or simply counting through a treasure trove of trick-or-treat sweets, my relationship with this spooky celebration is all about the edible. And reading through some of my favourite foodie sites in recent weeks would suggest I’m not alone. There’s hardly a blog out there that hasn’t produced some kind of Halloween-themed treat; from spooky spiderweb cupcakes to ghostly meringues, witch’s finger biscuits to candy corn and more variations on toffee, apple and pumpkin (think pies, cheesecakes, fudge, brownies, muffins and more) than you could make in a lifetime. My contribution to the festivities was inspired by one such post. Brisbane-based blogger Jennifer over at Delicieux recently shared a recipe for Mint Chocolate Cheesecake Brownie Tombstones. The macabre in me loved the idea of a twisted take on ‘Death by Chocolate’, and never needing much excuse to whip up a batch of brownies, I started planning my recipe. Last week my parents sent me an amazing Halloween package from Hotel Chocolat containing milk chocolate skulls, bats, ghosts and more. I’d originally intended to use them as decoration for my graveyard of brownies, but as the week went on – and the number of chocolates in the packet started to dwindle – I decided I needed to make more of an effort and create some decorations myself. Some people might find the skulls a little scary, but I’m thinking of them in more of a celebratory ‘Day of the Dead’ vein. The Mexicans originally used edible sugar skulls to adorn their altars because they couldn’t afford to import fancy European church decorations, and the tradition of smiley sugared skulls continues to this day. I quite like the idea behind them; of celebrating the lives of friends and family who have passed rather than being the spooky or scary symbol we often perceive a skull to be. Going back to the brownies, a thick chocolate batter is swirled with chopped pecans before baking until just the right state of squidginess. I never learn my lesson, and always try to cut the bars before the pan has cooled (hence the ragged edges in my photos), but if you let it cool completely, or pop them in the fridge to firm up for a few minutes, you’ll be able to slice into beautiful fudgy squares. 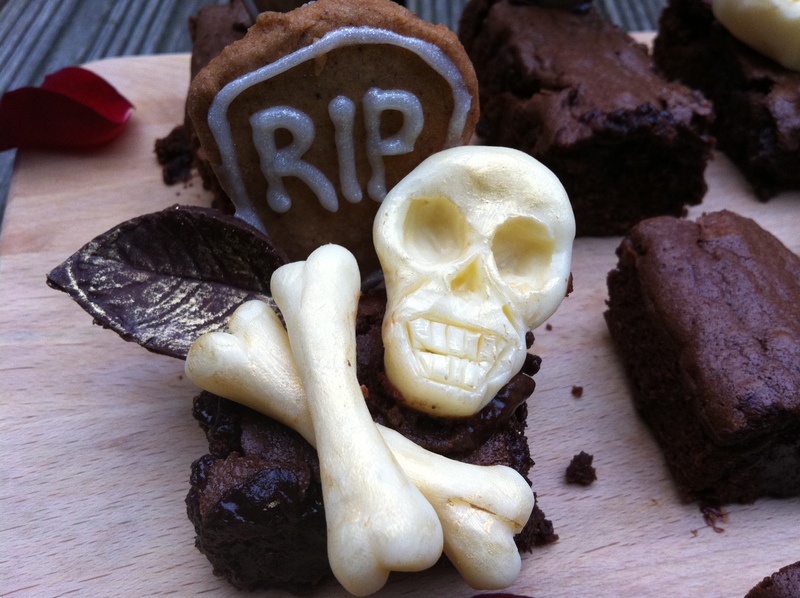 The tombstones are a basic biscuit dough piped with glitter icing then wedged into the brownie, and the skulls, bones and leaves are made with modeling chocolate dusted with a little edible gold powder. The whole process takes a little time, and is more than a little bit messy. The upright tombstone biscuits and precariously balanced decorations make them pretty tricky to store too, but that’s not really the point. They taste so sensational you’ll want to eat them all in one go, and the Halloween theme puts a pretty short expiry date on them anyway. Grease and line a 20cm square cake tin with foil. Preheat the oven to 175 degrees C.
Melt together the butter and chocolate in a bain marie, then set aside to cool slightly. Whisk together the eggs and sugars til light and fluffy, then add the cooled chocolate and butter mixture. Sift together the flour, cocoa powder and salt then stir into the chocolaty batter. Stir in the vanilla extract, milk and chopped pecans then pour into the prepared tin and bake for approx. 25 mins until just set, but the middle is still fairly fudgy. Use your favourite basic biscuit dough, cutting into tombstone shapes before baking. Allow to cool completely then decorate with writing icing or homemade icing consisting of icing sugar, water and a little food colouring. Leave to set. I’m sure there are more technical ways of doing this, but for the purposes of recreating what I did, all you’ll need are a sharp knife, a teaspoon and a small paintbrush. 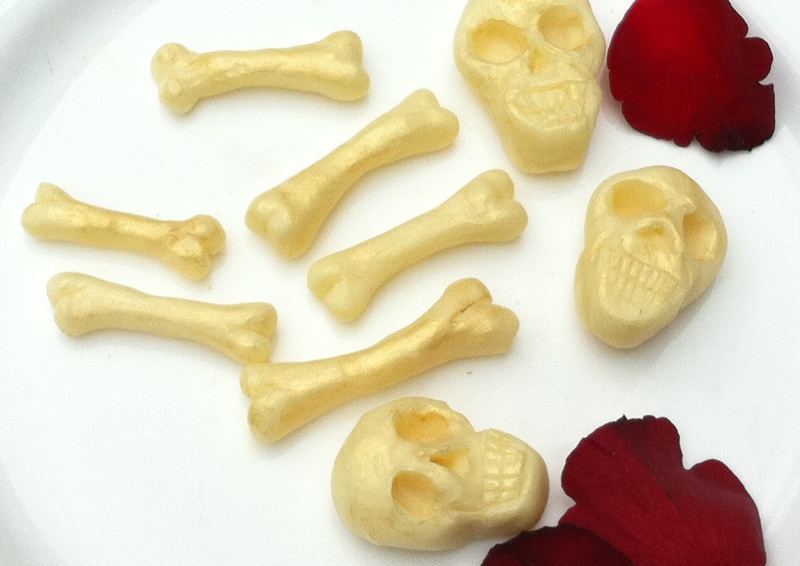 For the skulls, take a walnut sized ball of white modelling chocolate and shape into a long oval. Pinch the middle where the nose cavity should be, create a small indent beneath with a sharp knife then draw on the mouth and teeth. Hollow out two eye sockets with the small end of your teaspoon, then cut in the cheekbones and continue to shape and smooth until you are satisfied with your skull. For the bones, take a thumb sized ball of white modelling chocolate and roll until just over an inch long. Cut a slit at each end, then shape each of the four edges into a small round ball. This is your basic bone – you can adjust size according to how big you cut the brownies, and even shape the bones to different bits of the body if you so wish! 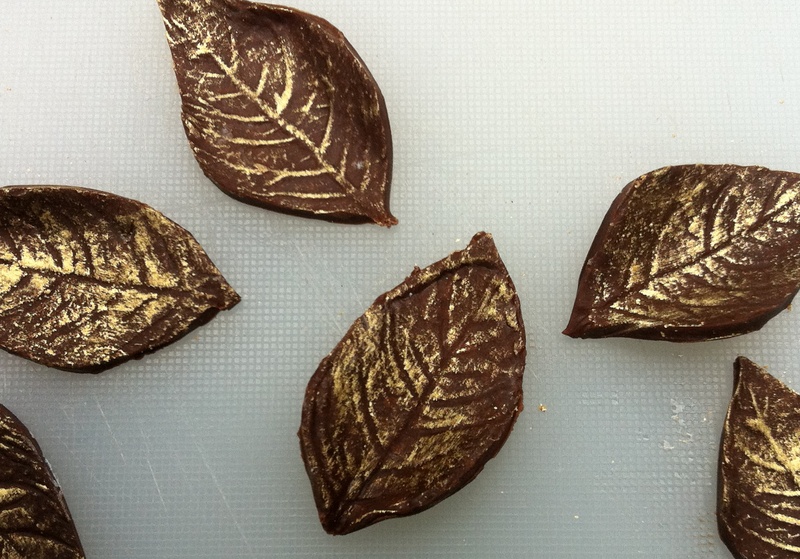 For the leaves… I cheated and used a pretty new leaf stamp which I couldn’t resist buying when purchasing my edible gold dust, but you could easily recreate the shape with a sharp knife and a little patience. Once you’ve made as many skulls, bones and leaves as you want to use, get a little pot of edible gold dust and brush all over each decoration. This gives them a sense of dimension, picks up the veins in the leaves and helps to cover up any thumbprints etc, as well as making them beautifully sparkly! Lay out the brownies on a cake or chopping board. 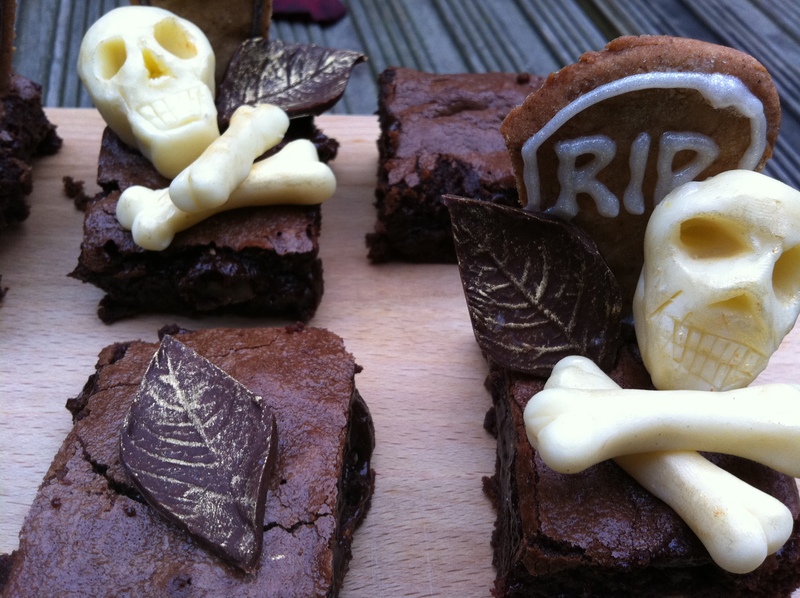 Glue the tombstone biscuits to the back of each brownie with a little melted chocolate or leftover icing. Allow to set, then glue the skulls, crossbones and leaves in place with a little more chocolate/icing. The brownies will keep out of the fridge for up to a week, but I defy anyone to let them last that long. I like your take on a Haloween treat and think the skull and crossbones are such a good idea… Modelling chocolate is a completely new one to me, so thanks I learned something new today! Totally agree with Kavey, they are FAB! I’ve never used modelling chocolate before but your skulls and crossbones turned out so great that I just might have to give it a try. Awesome job on the brownies! That’s a great, fun posts, Halloween is great for doing over the top things like that. As soon as there are all gone I know you’ll have your christmas thinking cap on too! Can’t wait for that one either! Fantastic. Love the decorations and they made me laugh. I’ve never done much (anything) for Halloween, but am appreciating all the fun stuff people are coming up with. I’ve been after gold dust or even gold leaf for ages. Do you have any recommendations as to where to get it? Laura – modeling chocolate is great. I get it from Squires Kitchen Shop but you can also make your own if you have the time! Amee – good point, will have to get my Christmas thinking cap on soon! Wow, these look fantastic, and I love the skull and bones!!! What a great job you did shaping these! Thank you for the mention, I am so honoured! WOW! What amazing brownies! Love all your special garnishes…these are really cool! Omg ! look at those cute little shuddery things. The whole graveyard is too interesting. Happy Halloween.cheers ! Love the Day of the Dead meets Halloween kitsch vibe! And yes, anything is better with gold on it. I got some gold leaf recently for a make up job and have been putting it on *everything* since! You do a seriously squidgy brownie. I can’t wait to sample them! Lorraine – they are kind of cute…noone wants to eat a scary brownie! Catering in Brighton – happy Halloween to you too! Miss South – the brownies were seriously squidgy…I’m still perfecting my ultimate brownie, so when we make our baked alaska the recipe may have changed slightly! These are so awesome! I love the decorations and I couldn’t believe the skulls were handmade – they look so professional! These look dangerously, dangerously good. oh lol, i laughed when is saw the tombstones. how amazing and hilarious. I’m sure these were a hit on halloween! 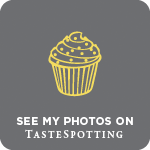 Baking Addict – glad you like. I want to put gold dust on everything now…thinking of what I can make next! Kathryn – aw, thank you. Tori – death by chocolate is a dangerous thing! I had to smile when I saw these. Well done you for being so creative (and gettin into the spirit of the season!). Can’t say my “Halloween Brack” pushed the boat out very far! Love the skulls and bones, and as you know from my post I have a real adoration for brownies! The gold dust really brings out the details, fabulous! Claire – it’s all about getting into the spirit of the holidays! Becs – thanks, gold dust is my latest obsession!